I’ve been spending a lot of the time in Memorial Hall Library in Andover, MA contemplating, transitioning and hopefully preparing for the next step(s) for what the future may hold. Libraries are interesting spaces for self-discovery if one is at a crossroads. 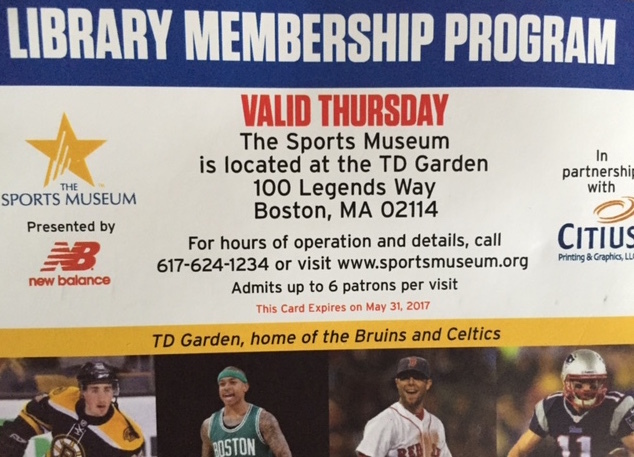 Ruben Sanca, a Cape Verdean Olympian distance runner gave a talk at Memorial Hall Library to a diverse audience of New England residents. He spoke about his London 2012 Olympics experience and other highlights from his running career as well as his training regime while working full-time at University of Massachusetts Lowell. He generously answered questions from the audience ranging from running shoes, injuries and recovery. Ruben Sanca, a Cape Verdean Olympian speaking at Memorial Hall Library. It was reassuring to hear Ruben give advice to parents of young athletes on how every athlete is different and the importance of having fun. His positive developmental message to the audience was to enable young athletes to develop an interest in sport through an organic process. As a qualified coach, I was pleased with Ruben’s view that parents should enable young athletes to continue if they derive enjoyment from their participation. 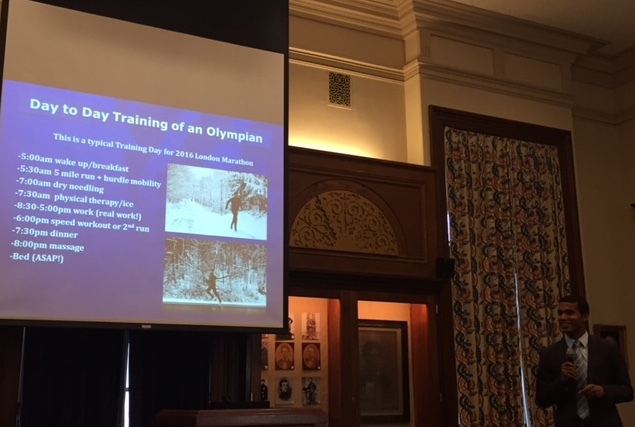 Overall, it was an educational experience to attend the Memorial Hall Library event and meet an Olympian who is waiting to find out if his wild-card entry to the 2016 Olympics in Rio will be granted. 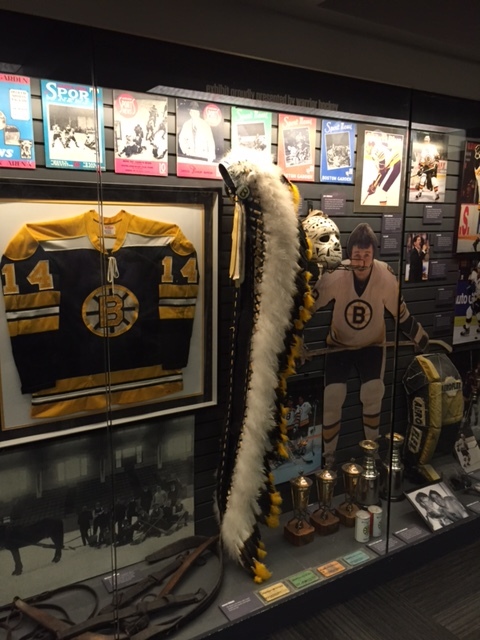 Thank you to the staff and volunteers at Memorial Hall Library for organizing programs and events of interest. I have been overwhelmed with emails from around the world and so pardon this slow blog entry. I am grateful, humbled and honored by the United States Olympic Committee’s recognition as the 2011 Developmental Coach of the Year for coaching student-athletes at Concord Academy while simultaneously serving as Director of Kidsquash, a community squash program situated at Harvard University. 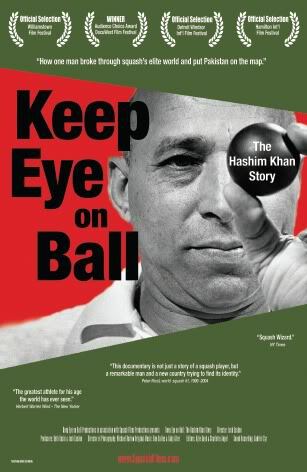 On the day I received news of the USOC recognition, I attended a Massachusetts Squash event at Dover Squash and Fitness in Natick, Massachusetts where I was fortunate to reunite with Jahangir Khan, (a legendary squash champion from Pakistan who dominated the sport in the 1980s) and thank him for inspiring me 23 years ago to want to play the sport during an exhibition match against Chris Dittmar in Jeddah, Saudi Arabia. Engrossed by the long, lively and exciting exchanges between Jahangir and Chris, definitely made an impression on me at a young age, but I never expected it would lead to a national recognition for coaching at Kidsquash and Concord Academy. 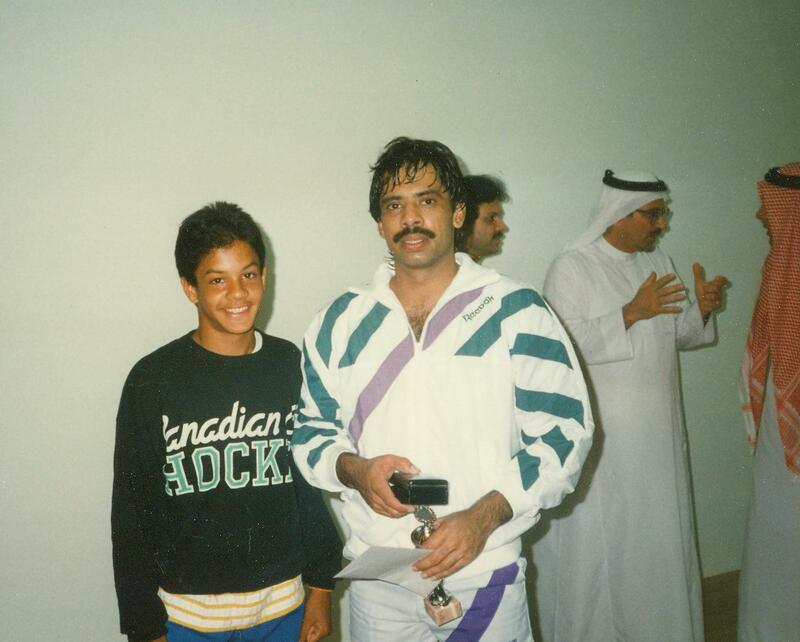 Jahangir Khan and I after his exhibition match at Arabian Homes in Jeddah, Saudi Arabia. 1989. 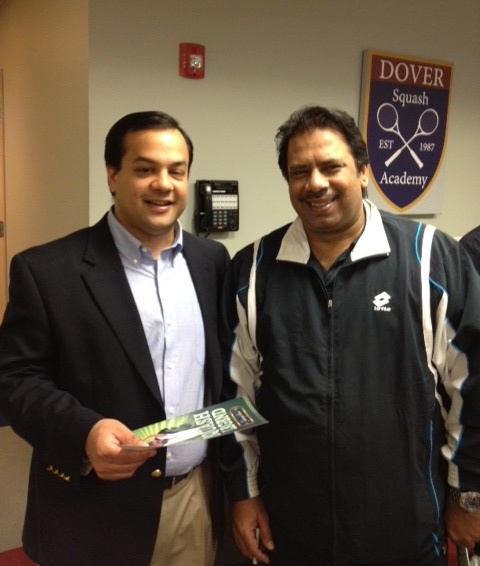 Jahangir Khan and I at Dover Squash and Fitness in Natick, Massachusetts, April 2012. The award is a testament to the bright, inquisitive and imaginative student-athletes at Concord Academy as well as the aspiring squash players who participate in the Kidsquash program. 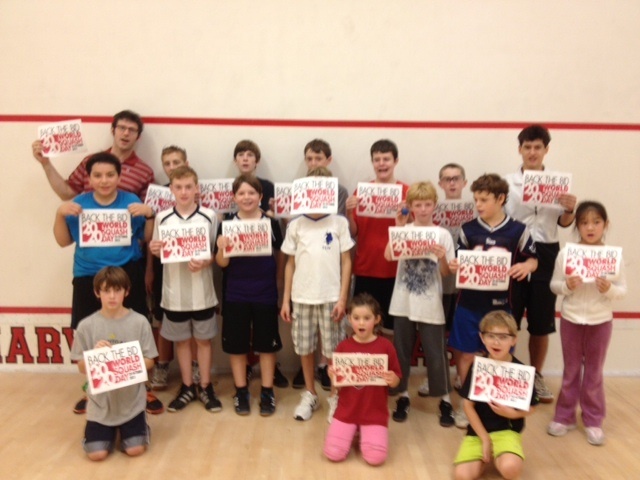 Both groups have challenged me to find new ways of teaching and growing the sport of squash. I would like to reach out to thank fellow coaches, faculty, staff, students, parents, alumni and members of the Greater Boston community who have all contributed to the USOC’s recognition. In particular, I would like to give my deepest thanks to my family members, in particular my parents, and friends for their support. Also, my mentor and colleague – Coach Bajwa deserves a special thanks for believing in me. 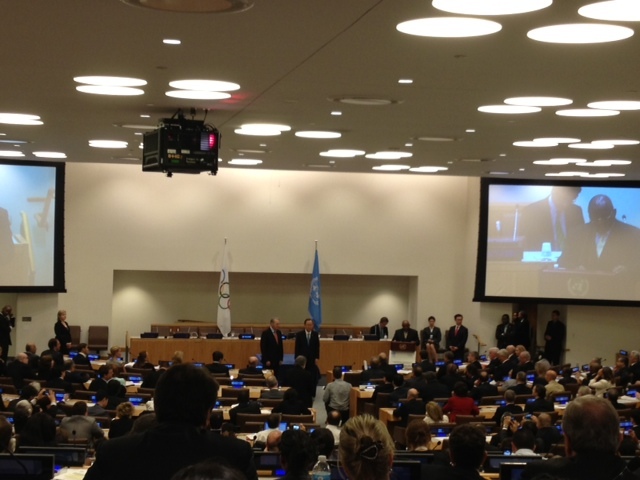 I hope this recognition demonstrates the values of teamwork, fair play and opportunity for all.